The title of the book caught my eye. The book sounded interesting with a bit of intrigue, so I add it to my personal reading list. 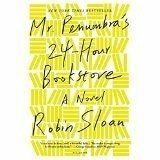 Mr. Penumbra’s 24 Hour Bookstore was another one I tackled over the holidays. The book is written by Robin Sloan and it is his first novel. The book is set in our modern, tech savvy world, but takes you back to a world of mystery where a secret organization is trying to crack secret messages and codes. Mr. Penumbra hires an out of work web designer to work the night shift in his 24 hour bookstore. This is where the mystery begins. Why do few people come in so late, go to the back of the store and then leave? The book was an easy read and went fairly fast. However, the book for me lacked any depth and was written in a manner similar to how we text and e-mail. The characters were boring and somewhat predicatable. A great book for me is one that transports me into another world. A way to travel without having to go anywhere. Mr. Penumbra’s did transport me, but it wasn’t a world I wanted to visit. A Google world where technology is being used to replace good ol’ research. A world in which we live today. To much technology has disconnected us from personal contact and that is what begins to happen with the story. Everything is at our finger tips with the web and I miss going to the library to do actual research. Then it dawns on me I am using technology to read this book on a Kindle, not an actual book. Hmmm, makes one think. Maybe it’s time to pick up an actual book and smell the pages and touch them as each one is turned. I didn’t love the book and found myself dreading opening up my Kindle to read. I did finish it and felt let down at the ending. Not one of my favorites. If you are a techy, you may want to give it a try. I’ll bee finishing “Prayers for Sale” by Sandra Dallas soon. I will see you back here to give it a review.